USD/ZAR is currently trading around 13.78 levels. It made intraday high at 13.78 and low at 13.73 levels. Intraday bias remains neutral till the time pair holds key support at 13.73 mark. A daily close above 13.73 will take the parity higher towards key resistances around 13.94, 14.02, 14.12, 14.32, 14.50, 14.78 and 14.99 marks respectively. Alternatively, a daily close below 13.73 will drag the parity down towards key supports at 13.68, 13.53, 13.26 and 13.07 levels respectively. South Africa will release gold production as well as mining production data at 0930 GMT. 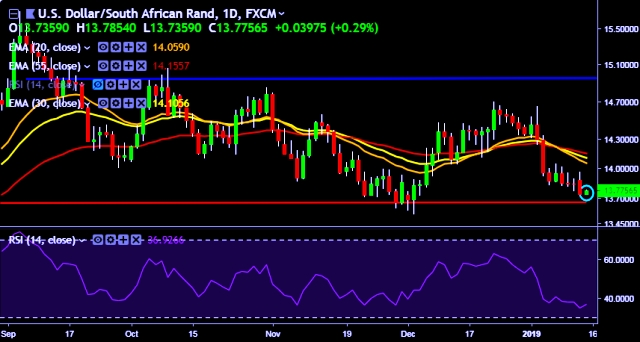 We prefer to take short position on USD/ZAR only below 13.73, stop loss at 14.02 and target of 13.53/13.26.